seaplanes often use a curved takeoff run. I'm trying to imagine why but cannot come up with a good reason. Years ago now I gave a fair amount of instruction for seaplane ratings. I remember it quite fondly as seaplanes combine the fun of flying with aspects of the fun of boating. There were three conditions in which we used curved takeoff runs. The most frequent curved takeoffs were on rivers, which tend to not run in a straight line, and even for those portions of a river that do, there may be rapids to stay clear of, so following the bend of a river or weaving between rapids was not unusual. In my case, the rivers were the McKenzie and Willamette, both in Oregon, USA. If you're ever in Eugene, Oregon, go down to Skinner's Butte Park on the Willamette River. On the upstream end of the park is the Ferry Street bridge. On the downstream end is the Washington-Jefferson bridge. In the 1970s we used to operate on the water between them, avoiding the rapids. We stored the airplane for a time on the Skinner's Butte Park shore line. That was legal and safe back then. The next most frequent usage of curved takeoffs was to get off ponds that were not wide enough to allow a straight line takeoff. However, you can do it taking off in a curve along the perimeter of the pond. If you ever happen to fly over Daniels Field alongside Interstate 5 about 20 miles north of Eugene, Oregon, you'll see a lake/pond alongside the runway with a small island in the middle. There is no straight line you can draw on that pond that comfortably gives you room for takeoff, but you can circle the island and get into the air without difficulty. The third circumstance we didn't have to use often was when we had to run across our own wake to be able to get up on the step on glassy water. For example, Waldo Lake in the Oregon Cascades is at 5,400 feet elevation. A J-3 cub with an 85 horse engine and with two people on board simply cannot get up on the step when the surface of the lake is a dead calm. However, if you get going in a curved path, you can get up on the step when you run across your own wake. Once you're on the step, you can then put the airplane up on one float and get enough airspeed to take off. Just as a matter of information, seaplane operation on Waldo Lake is now prohibited. The pilot plans a curved path and follows this arc to produce sufficient centrifugal force so that the seaplane tends to lean outward against the wind force. During the run, the pilot can adjust the rate of turn by varying rudder pressure, thereby increasing or decreasing the centrifugal force to compensate for a changing wind force. In practice, it is quite simple to plan sufficient curvature of the takeoff path to cancel out strong crosswinds, even on very narrow rivers. 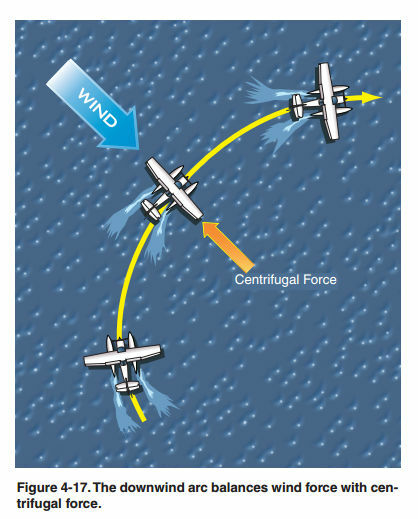 Note that the tightest part of the downwind arc is when the seaplane is traveling at slower speeds. The waves are running separate from the wind. When the plane has pick up enough out of the water it turns into the wind. Not the answer you're looking for? Browse other questions tagged takeoff seaplane or ask your own question. Do floatplanes land on rivers? Has anyone considered putting a hydrofoil on a sea plane? Why don't airliners use full throttle on takeoff? Could fly-by-wire protect against a takeoff tail strike?